The sudden onset of snow across the UK made deliveries a little difficult, so there was no whisky to preview this month! Fortunately 15 of the bottles arrived in time for the First Friday and the Saturday New List tasting, so here's a delayed preview. The other 11 whiskies will hopefully be along next week! The stars of the show are a varied bunch - the wonderfully sweet and fruity Auchentoshan, the delicate and delicious Cameronbridge, the tropical fruits of the Linkwood and the sweet meaty smokey delights of the Glen Scotia. That selection is a great night's drinking no matter what your poison is! There's also the three drams that scored four, if you need further dramming. The chewy, gingerish Glenlivet. The bubblegum joy of the Balmenach. 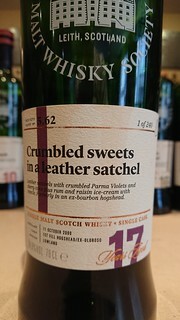 The sweet yet ashen Bunnahabhain. Don't be fooled - a four's not a bad score at all, and these are all great drams. And there's eleven more to find out about next week! Hurrah!